The selling point of Celerio Diesel is its magnificent fuel efficiency – Maruti Suzuki claims it is the country’s most efficient diesel car with a mileage of 27.62 Kmpl. 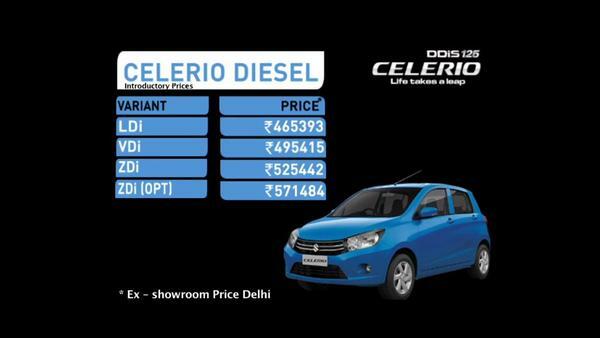 Maruti Suzuki has unveiled the price of recently launched Celerio Diesel. The car comes in 4 different variants and the price differs accordingly. EZ Space: XpanDesign, Roomy cabin, Spacious headroom, legroom and shoulder-room, large boot space and 15 smart utility spaces. EZ Gizmos: Stereo with Bluetooth connectivity, Steering mounted audio controls, multi-info display, user-friendly customizable security settings . EZ Style: CICO ( Curve In Curve Out) Styling, Big road presence, Sweeping wave dash design.